CARFAX 1-Owner, GREAT MILES 8,968! 750i xDrive trim. PRICED TO MOVE $2,200 below Kelley Blue Book! Nav System, Heated Leather Seats, Moonroof, Rear Air, Turbo Charged Engine, Back-Up Camera, All Wheel Drive, COLD WEATHER PACKAGE CLICK ME! This 750i xDrive is priced $2,200 below Kelley Blue Book. Leather Seats, Navigation, All Wheel Drive, Rear Air, Back-Up Camera, Turbocharged, Premium Sound System, Satellite Radio, iPod/MP3 Input, Onboard Communications System, Dual Moonroof, Keyless Start, Dual Zone A/C, WiFi Hotspot, Hands-Free Liftgate. MP3 Player, Keyless Entry, Child Safety Locks, Steering Wheel Controls, Electronic Stability Control. EXECUTIVE PACKAGE Front Ventilated Seats, Instrument Panel w/Nappa Leather Finish, Power Rear Sunshade & Rear Side Window Shades, Front Massaging Seats, Ceramic Controls, M SPORT PACKAGE M Sport Exhaust System, Without Lines Designation Outside, Shadowline Exterior Trim, Aerodynamic Kit, Anthracite Headliner, Wheels: 19" x 8.5" M Lt Alloy Double Spk Bi-Color Style 647M, Fineline Black Wood Trim, M Sport Package (337), DRIVER ASSISTANCE PACKAGE rear cross-traffic alert, Active Driving Assistant, Active Blind Spot Detection, Frontal Collision Warning, city collision mitigation, Speed Limit Info, Daytime Pedestrian Protection, Lane Departure Warning, COLD WEATHER PACKAGE Front & Rear Heated Seats, Heated Steering Wheel, APPLE CARPLAY COMPATIBILITY, TRANSMISSION: SPORT AUTOMATIC (STD). 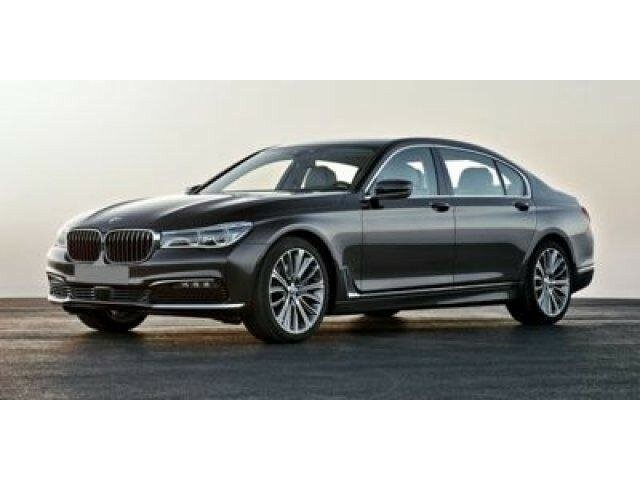 BMW 750i xDrive with Azurite Black Metallic exterior and Cognac Nappa Leather interior features a 8 Cylinder Engine with 445 HP at 5500 RPM*.